Our websites come with all the lead capturing tools you are looking for from landing pages, mobile leads, social leads and advance lead capture on your site to of course. Our sites have all the features you are looking for! Free SSL, fully responsive (mobile optimized), pre-built including tools, calculators, free reports and more. And the award winning designs are fully customizable, you can add, remove text, pics, and forms! We have your social media and mobile strategies covered with the most advanced tools and features. Responsive mobile sites, advanced social media integration post-bot auto posting! Mobile secure document uploader, embedded lead capture in Facebook and more. With our one of a kind landing page module you can create and customize landing pages for all of your campaigns from PPC to Facebook, to Zillow, Bankrate and much more. Our industry leading secure 1003 application imports directly in major LOS such as Calyx Point, Encompass and of course its designed by user interface experts for a smooth experience and more completed apps. Click to see even more! Our landing page module provides you with the next level in lead generation and marketing. Choose from a variety of templates and then customize them to fit your needs! Not only do we offer the most professional designs, they are also fully customizable. If you want to change content, pictures, pages, tabs, etc its easy to do. Our new app suite will offer you the ability to customize and create your own 1003 applications. Don’t want a field require or want to add a new field – you can and its easy! 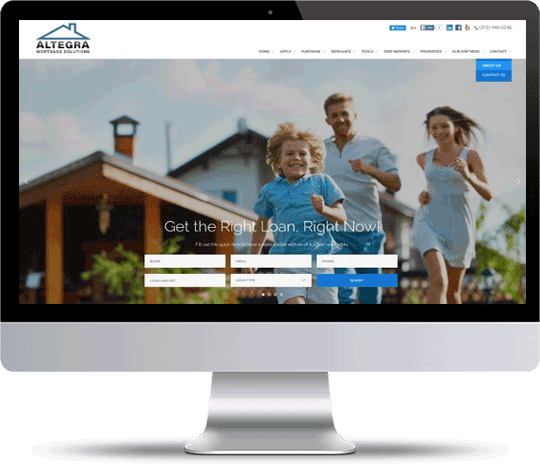 As the market leader in mortgage website marketing design, and lead generation we have you covered. Complete and ready to rock and roll 30 minutes after you sign up, our sites are also fully customizable from every picture, tab, page, to the questions and fields on your forms. And yes its easy to use and offer training and support if you get stuck. Our new 1003 application software offers the ability to create custom apps. You control what questions you want to ask. Want to add a question not on the 1003 no problem. Don’t want to ask certain questions no problem. All done through your control panel. And of course you can still brand the look and feel to your company. Social Media is the place people go when they are online. We help you get there too. From social media integration into your site to scheduled posting to multiple social platforms. To Facebook lead generation and page design enhancements to give you that professional edge. We have you covered. If you are marketing on the internet then you are probably going to need landing pages. We have multiple templates to use and of course they are fully customizable. Change text, pics, embed video, edit form fields. Included with premiere and elite plans. Mobile marketing is becoming more important as people shift their internet usage increasingly to mobile devices. Our combination of: design, technology and marketing materials make us the easy choice for your internet marketing needs. Our sites are ready out of the box, but also fully customizable so if you need to change content from images, tabs, questions on lead capture, or even add video its no problem! As the market leader in internet marketing for mortgage and related companies we don’t rest on our laurels selling old sites and products. Our team is always busy at work improving and adding on to our product offerings. Still not convinced well give you a phone call after you sign up to welcome you aboard and help you get started. We stay on top of the of latest trends in internet marketing and bring them to you first so you can stay a step ahead of your competition. We know we have the best products but if you can't fully utilize them then what good is that? That's why we have phone as well as full online training and support. We'll help you stay compliant with security and procedures. It’s what your looking for! I'm not a tech wiz so I was scared to shift to internet marketing, but Nick made it so easy to get setup and helped with my questions along the way. Now I'm generating almost half of my loans off the web!